Please Join Us for an Incredible Mississippi River Fishing Adventure! We provide a great experience of fishing and fun for all ages, with easy accessibility. We have 12 floating docks or piers located directly below Lock and Dam 8, in Genoa Wisconsin. You have the opportunity to fish from a secure location not only loaded with fish, but such amenities as chairs, benches, picnic tables, restrooms, landing nets and a lunch room providing food, tackle and accessories on site. We have everything you could possibly need for an enjoyable experience. This is a place for both the experienced angler and the novice angler. We are here to help you catch some fish. We are located just below Lock and Dam #8. On the shoreline is a flag pole with an orange flag. Once you raise the flag we make a trip across the beautiful Mississippi River to pick you up. We make trips on the half hour in the mornings and on the hour in the afternoons to bring you to this ideal location. 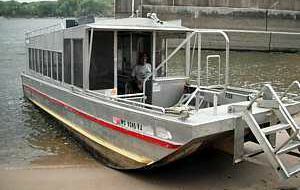 Our enclosed 19 passenger Coast Guard inspected vessel will bring you to us on the Minnesota side of the river. Be sure to pick up your live bait at Captain Hook’s Bait and Tackle here in Genoa before you come over. You can use a MN or WI fishing license. Look to our FAQ page for frequently asked questions. Our hours of operation are from 7 a.m. to 5 p.m. Sunday to Thursday. We are open 7 a.m. to 6 p.m. on Friday and Saturday. In July we are only open on Friday, Saturday and Sunday’s, from 7 to 5. We are closed in August. Please check out our Calendar for specific dates, specials and local happenings. 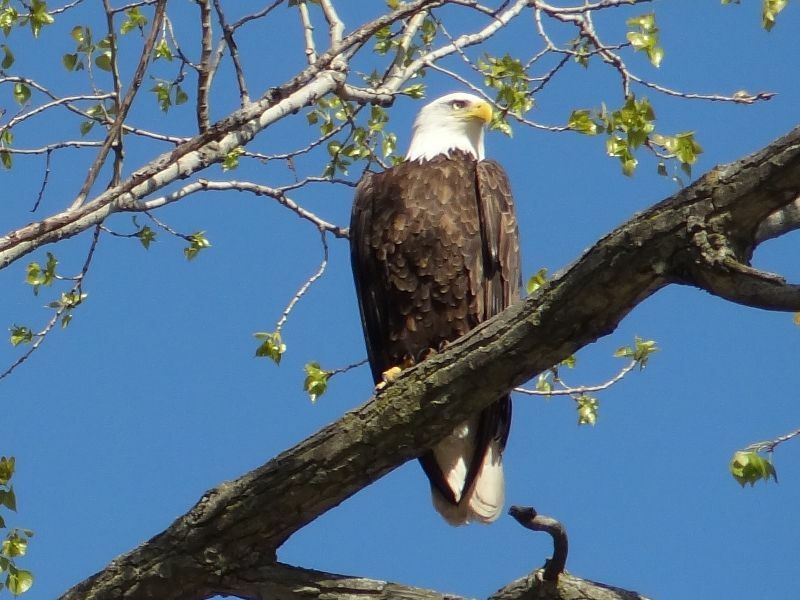 While you are fishing, keep a watch for Bald Eagles. These magnificent creatures have graced the community with their presence for decades. It is difficult to mistake an adult bald eagle because of its distinctive white head and tail and its immense six to eight foot wingspan. There are a 134 aquatic species located within the Refuge. You never know what you might catch! Most people are after the Mississippi River Walleye and look forward to when the run begins in April. You could catch some huge Walleye or their counterparts, the elusive Sauger. Our fantastic Perch fishing starts right away in March, while Bluegill, Crappie, Bass will begin to fill in towards the end of April into May. Come join us for your Mississippi River fishing adventure by using our contact form, or call 608-689-2800 today!! 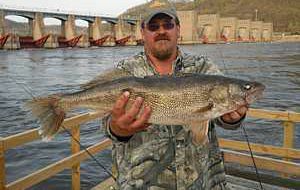 Page Summary: Clements Fishing Barge offers Mississippi River fishing, fishing spots, fishing for walleye and places to go fishing. Services such as fishing for pike, local fishing, fishing place as well as bass fishing spots are also part of the scope of our business. 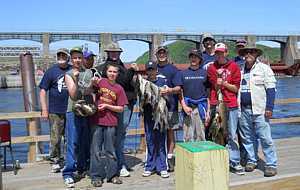 We also specialize in best fishing spots in America near Genoa, La Crosse, Onalaska as well as Winona, MN. Other areas we serve include Prairie du Chien, Stoddard, Lansing Iowa and DeSoto. We also service Victory, Viroqua and beyond.